847（258） 72 2019 2017年9月封顶。 Also known as 252 South Street or 227 Cherry Street. High-rise Buildings of New York City. Emporis.com. [2008-06-17]. ^ One World Trade Center. The Skyscraper Center. CTBUH. [2013-05-12]. （原始内容存档于2013-05-07）. ^ Murray, Matt; Kim, Eun Kyung. Cheers Erupt as Spire Tops One World Trade Center. CNBC. 2013-05-14 [2013-05-12]. （原始内容存档于2013-10-29）. ^ Diagram of New York City skyscrapers. SkyscraperPage.com. [2012-07-23]. ^ Most Active: Continents: North America: U.S.A. Emporis.com. [2008-06-16]. （原始内容存档于2007-04-23）. ^ 6.0 6.1 One World Trade Center. The Skyscraper Center. CTBUH. [2013-05-12]. ^ 7.0 7.1 7.2 7.3 7.4 Murray, Matt; Kim, Eun Kyung. Cheers Erupt as Spire Tops One World Trade Center. CNBC. 2013-05-14 [2013-05-12]. ^ 8.0 8.1 8.2 One World Trade Center. Emporis.com. [2013-05-12]. ^ 9.0 9.1 Empire State Building. Emporis.com. [2007-11-19]. ^ 10.0 10.1 10.2 Bank of America Tower. Emporis.com. [2007-12-31]. ^ 11.0 11.1 11.2 Chrysler Building. Emporis.com. [2007-11-19]. ^ CTBUH Affirms One World Trade Center Height. Council on Tall Buildings and Urban Habitat. 2013-11-12. ^ 13.0 13.1 13.2 Four World Trade Center. Emporis.com. [2007-11-19]. ^ 14.0 14.1 Two World Trade Center. SkyscraperPage.com. [2012-07-21]. ^ Three World Trade Center. CTBUH. [2012-07-21]. （原始内容存档于2013-07-30）. ^ 16.0 16.1 World Building. SkyscraperPage.com. [2007-11-19]. ^ 17.0 17.1 17.2 World Building. Emporis.com. [2008-06-16]. ^ 18.0 18.1 18.2 World's Tallest Towers: Timeline of all Skyscrapers Holding the Title of Tallest Building in the World From 1890 to the Present. skyscraper.org. [2008-06-16]. ^ 19.0 19.1 One World Trade Center. Emporis.com. [2007-11-19]. ^ World Trade Center. Emporis.com. [2008-06-16]. （原始内容存档于2008-03-15）. ^ One World Trade Center To Supplant Willis Tower As Nation's Tallest Building. CBS Chicago. 2012-04-13 [2012-07-21]. ^ 22.0 22.1 Inside the Tallest Residential Building in the Western Hemisphere. ^ 23.0 23.1 New Manhattan Tower Is Now the Tallest - press. 432PARKAVENUE. （原始内容存档于2014-12-04）. ^ 30 Hudson Yards Officially Tops Out 1,296 Feet Above Street Level. 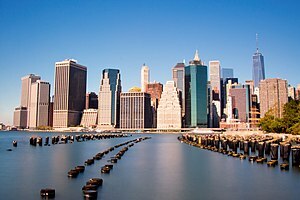 NewYorkYimby.com. [2018-07-03]. ^ Hudson Yards’s 1,009-foot residential tower tops out. NY.Curbed.com. [2018-06-25]. ^ 26.0 26.1 26.2 26.3 Empire State Building. Faa.gov. [2010-08-04]. ^ 27.0 27.1 Bank of America Tower. SkyscraperPage.com. [2008-06-16]. ^ 3 World Trade Center || Construction || Images || World Trade Center ||. Wtc.com. [2016-08-29]. ^ 3 World Trade Center Opens Today: Here's a Look Inside. Commercial Observer. 2018-06-11 [2018-06-11] （美国英语）. ^ 53W53 - Private Air March-April 2016 (PDF). http://www.53w53.com/. ^ Tapering Begins As 111 West 57th Street Reaches For 1,428-Foot Pinnacle. New York Yimby. ^ 32.0 32.1 32.2 Chrysler Building. SkyscraperPage.com. [2007-11-22]. ^ 33.0 33.1 New York Times Tower. Emporis.com. [2007-11-19]. ^ 34.0 34.1 New York Times Headquarters. SkyscraperPage.com. [2007-11-22]. ^ Related’s 35 Hudson Yards Tops Out As Neighborhood’s First Residential Supertall. New York YIMBY. [2018-06-25]. ^ Stephen Smith. Permits Filed: 35 Hudson Yards, 1,009-Foot Office/Hotel/Condo Tower. New York YIMBY. 2015-01-28. （原始内容存档于2017-03-30）. ^ 37.0 37.1 One57. The Skyscraper Center. CTBUH. [2013-03-08]. ^ 38.0 38.1 One57. SkyscraperPage.com. [2013-03-08]. ^ Dunlap, David W. A 977-Foot Tower You May Not See, Assuming You've Even Heard of It. New York Times. 2012-06-24 [2012-07-21]. ^ 40.0 40.1 150 Greenwich. SkyscraperPage.com. [2007-11-22]. ^ New York Today: Skyward. 2013-11-13. ^ 69-Story, 116-Unit Residential Tower Tops Out at 220 Central Park South. NYYIMBY. [2017-11-30]. ^ 43.0 43.1 American International. Emporis.com. [2007-11-19]. ^ 44.0 44.1 American International Building. SkyscraperPage.com. [2007-11-22]. ^ 30 Park Place. SkyscraperPage.com. [2012-07-22]. ^ Construction Update: 30 Park Place Actually Tops Out. New York YIMBY. [2015-04-01]. ^ The Trump Building. Emporis.com. [2007-11-19]. ^ 49.0 49.1 Trump Building. SkyscraperPage.com. [2007-11-22]. ^ Citigroup Center. Emporis.com. [2007-11-19]. ^ Citigroup Center. SkyscraperPage.com. [2007-11-22]. ^ Plitt, Amy. 15 Hudson Yards tops out as megaproject preps for spring 2019 debut. Curbed NY. 2018-02-27 [2018-02-27]. ^ KKR to Buy Offices at Hudson Yards, Relocate From Plaza District. Bloomberg Business. [2015-11-13]. ^ 10 Hudson Yards. SkyscraperPage.com. [2015-11-13]. （原始内容存档于2015-11-17）. ^ Living in a 76-Story Work of Art, and a Symbol of Rebirth. 2011-11-28 [2012-07-21]. ^ The Beekman. Emporis.com. [2012-07-21]. ^ 8 Spruce Street. SkyscraperPage.com. [2012-07-21]. ^ Trump World Tower. Emporis.com. [2012-07-21]. ^ Trump World Tower. SkyscraperPage.com. [2012-07-21]. ^ GE Building. Emporis.com. [2007-11-19]. ^ GE Building. SkyscraperPage.com. [2007-11-22]. ^ Plitt, Amy. Extell's One Manhattan Square tops out on the Lower East Side. 2017-09-29 [2018-08-13]. ^ Extell’s 250 South Street Will Total 68 Floors & 1.1 Million Square Feet. [2015-07-14]. ^ Barbanel, Josh. Condo's Price Is Straight Up. The Wall Street Journal. 2013-06-26. ^ 56 Leonard Street. Emporis.com. [2009-08-06]. ^ Construction Update: 56 Leonard Finally Tops Out. New York YIMBY. [2015-11-13]. ^ CitySpire Center. Emporis.com. [2007-11-19]. ^ CitySpire Center. SkyscraperPage.com. [2014-05-07]. ^ Cityspire Center. The Skyscraper Center. CTBUH. [2013-03-08]. ^ One Chase Manhattan Plaza. Emporis.com. [2007-11-19]. ^ One Chase Manhattan Plaza. SkyscraperPage.com. [2007-11-22]. ^ 72.0 72.1 Condé Nast Building. Emporis.com. [2007-11-19]. ^ 73.0 73.1 Conde Nast Building. SkyscraperPage.com. [2007-11-22]. ^ MetLife Building. Emporis.com. [2007-11-19]. ^ MetLife Building. SkyscraperPage.com. [2007-11-22]. ^ 76.0 76.1 Bloomberg Tower. Emporis.com. [2007-11-19]. ^ 77.0 77.1 Bloomberg Tower. SkyscraperPage.com. [2007-11-22]. ^ Fedak, Nikolai. Pelli Clarke Pelli-Designed 138 East 50th Street Tops Out At 800′, Midtown East. 2017-11-22 [2018-08-13]. ^ Revealed: 138 East 50th Street, 803-Foot-Tall Midtown Condo Tower Designed by Pelli Clarke Pelli. [2015-09-10]. ^ 111 Murray Street. The Skyscraper Center. Council on Tall Buildings and Urban Habitat. [2016-11-10]. （原始内容存档于2016-08-28）. ^ Woolworth Building. Emporis.com. [2007-11-19]. ^ 82.0 82.1 Woolworth Building. SkyscraperPage.com. [2007-11-22]. ^ 54-Story, 33-Unit Luxury Residential Tower Tops Out at 520 Park Avenue, Upper East Side. YimbyNews.com. [2018-06-28]. ^ 520 Park Ave. Skyscraper Page. [2014-03-25]. （原始内容存档于2014-03-26）. ^ 55 Hudson Yards Tops Out 51 Floors And 780 Feet Above Street Level, Midtown West. YimbyNews.com. [2018-08-13]. ^ Dailey, Jessica. 55 Hudson Yards Designed As 'A Basic, Fundamental Sculpture'. Curbed NY. 2014-06-04 [2014-06-04]. （原始内容存档于2016-01-08）. ^ Kalinowski, Gail. Related Cos., Oxford Unveil Fifty Five Hudson Yards. Commercial Property Executive. 2014-06-05 [2014-06-05]. （原始内容存档于2014-06-06）. ^ 55 Hudson Yards. Skyscraper Page. [2014-07-07]. （原始内容存档于2014-07-01）. ^ One Worldwide Plaza. Emporis.com. [2007-11-19]. （原始内容存档于2008-03-01）. ^ One Worldwide Plaza. SkyscraperPage.com. [2007-11-22]. （原始内容存档于2007-12-17）. ^ 50 West Street. Emporis.com. [2009-08-06]. ^ 50 West Street. SkyscraperPage.com. [2009-08-06]. （原始内容存档于2010-02-02）. ^ 50 West Street Is Topped Out And Nearing Exterior Completion. New York YIMBY. [2015-11-13]. ^ 45 East 22nd Street Reaches 777′ Pinnacle And Tops Out. NY YIMBY. [2016-05-07]. ^ 45 East 22nd Street. The Skyscraper Center. [2016-05-07]. ^ Downtown development site fetches $171M. crainsnewyork. （原始内容存档于2017-04-19）. ^ 118 Fulton Street, 63-Story Financial District Residential Tower. ^ 118 Fulton Street Tops Out At 63 Floors in New York’s Financial District. YimbyNews.com. [2018-08-13]. ^ Carnegie Hall Tower. Emporis.com. [2007-11-19]. ^ Carnegie Hall Tower. SkyscraperPage.com. [2007-11-22]. ^ Bear Stearns World Headquarters. Emporis.com. [2007-11-19]. ^ Bear Stearns World Headquarters. SkyscraperPage.com. [2007-11-22]. ^ Courtyard and Residence Inn Manhattan Central Park. The Skyscraper Center. CTBUH. [2013-03-08]. ^ Geiger, Daniel. 1717 Broadway, Newly Topped Out, Carries the Torch Blighting Rivals' Views. New York Observer. 2012-10-04 [2013-03-08]. ^ 1715 Broadway. SkyscraperPage. [2013-03-08]. ^ Broadway hotel, hemisphere's tallest hotel, tops out. The Real Deal. Korangy Publishing Inc. 2012-10-04 [2013-03-13]. ^ AXA Center. Emporis.com. [2007-11-19]. ^ AXA Center. SkyscraperPage.com. [2007-11-22]. ^ One Penn Plaza. Emporis.com. [2007-11-19]. ^ One Penn Plaza. SkyscraperPage.com. [2007-11-22]. ^ 1251 Avenue of the Americas. Emporis.com. [2007-11-19]. ^ 1251 Avenue of the Americas. SkyscraperPage.com. [2007-11-22]. ^ Time Warner Center South Tower. Emporis.com. [2007-11-19]. ^ 114.0 114.1 Time Warner Center. SkyscraperPage.com. [2007-11-22]. ^ Time Warner Center North Tower. Emporis.com. [2007-11-19]. ^ Goldman Sachs Headquarters. Emporis.com. [2012-07-21]. ^ Goldman Sachs New World Headquarters. SkyscraperPage.com. [2012-07-21]. ^ 60 Wall Street. Emporis.com. [2007-11-19]. ^ 60 Wall Street. SkyscraperPage.com. [2007-11-22]. ^ One Astor Plaza. Emporis.com. [2007-11-19]. ^ One Astor Plaza. SkyscraperPage.com. [2007-11-22]. ^ 7 World Trade Center. Emporis.com. [2008-06-16]. （原始内容存档于2007-09-30）. ^ Seven World Trade Center. SkyscraperPage.com. [2007-11-22]. （原始内容存档于2007-12-17）. ^ One Liberty Plaza. Emporis.com. [2007-11-19]. ^ 1 Liberty Plaza. SkyscraperPage.com. [2007-11-22]. ^ 20 Exchange Place. Emporis.com. [2007-11-19]. ^ 20 Exchange Place. SkyscraperPage.com. [2007-11-22]. ^ Three World Financial Center. Emporis.com. [2007-11-19]. ^ Three World Financial Center. SkyscraperPage.com. [2007-11-22]. ^ 62-Story, 426-Unit Mixed-Use Tower Nears Topping Out at 242 West 53rd Street, Midtown.. YimbyNews.com. [2018-08-13]. ^ YIMBY, New York. Permits Filed: 242 West 53rd Street. New York YIMBY. 2014-06-10 [2014-08-24]. （原始内容存档于2017-03-30）. ^ Bertelsmann Building. Emporis.com. [2007-11-19]. ^ Bertelsmann Building. SkyscraperPage.com. [2007-11-22]. ^ 62-Story, 844-Unit Residential Building Three Manhattan West Tops Out In Midtown West. NY YIMBY. ^ Manhattan West's 62-Story Residential Tower Tops Out. Curbed NY.com. （原始内容存档于2016-04-13）. ^ Times Square Tower. Emporis.com. [2007-11-19]. ^ Times Square Tower. SkyscraperPage.com. [2007-11-22]. ^ Metropolitan Tower. Emporis.com. [2007-11-19]. ^ Metropolitan Tower. SkyscraperPage.com. [2007-11-22]. ^ 252 East 57th Street. ^ Norman Foster's Slender Midtown Condo Has Topped Out. Curbed NY. [2016-01-14]. ^ Construction Update: 100 East 53rd Street, Aka 610 Lexington Avenue. New York YIMBY. [2016-01-14]. ^ JP Morgan Chase World Headquarters. Emporis.com. [2007-11-19]. ^ JP Morgan Chase World Headquarters. SkyscraperPage.com. [2007-11-22]. ^ General Motors Building. Emporis.com. [2007-11-19]. ^ General Motors Building. SkyscraperPage.com. [2007-11-22]. ^ Metropolitan Life Insurance Company Tower. Emporis.com. [2007-11-19]. ^ 148.0 148.1 Met Life Tower. SkyscraperPage.com. [2007-11-22]. ^ 500 Fifth Avenue. Emporis.com. [2014-05-07]. ^ 500 Fifth Avenue. SkyscraperPage.com. [2007-11-22]. ^ Americas Tower. Emporis.com. [2007-11-19]. ^ Americas Tower. SkyscraperPage.com. [2007-11-22]. ^ Solow Building. Emporis.com. [2007-11-19]. ^ Solow Building. SkyscraperPage.com. [2007-11-22]. ^ HSBC Bank Building. Emporis.com. [2007-11-19]. ^ HSBC Bank Building. SkyscraperPage.com. [2007-11-22]. ^ 55 Water Street. Emporis.com. [2007-11-19]. ^ 55 Water Street. SkyscraperPage.com. [2007-11-22]. ^ 277 Park Avenue. Emporis.com. [2007-11-19]. ^ 277 Park Avenue. SkyscraperPage.com. [2007-11-22]. ^ 1585 Broadway. Emporis.com. [2014-05-07]. ^ Morgan Stanley World Headquarters. SkyscraperPage.com. [2007-11-22]. ^ Random House Tower. Emporis.com. [2007-11-19]. ^ Random House Tower. SkyscraperPage.com. [2007-11-22]. ^ Four Seasons Hotel. Emporis.com. [2007-11-19]. ^ Four Seasons Hotel. SkyscraperPage.com. [2007-11-22]. ^ 605 West 42nd Street. SkycraperPage.com. [2014-01-15]. ^ McGraw-Hill Building. Emporis.com. [2007-11-19]. ^ McGraw-Hill Building. SkyscraperPage.com. [2007-11-22]. ^ Lincoln Building. Emporis.com. [2007-11-19]. ^ Lincoln Building. SkyscraperPage.com. [2007-11-22]. ^ 173.0 173.1 Citicorp Building. Emporis.com. [2007-11-19]. ^ Citigroup Building. SkyscraperPage.com. [2007-11-22]. ^ Barclay Tower. Emporis.com. [2007-11-19]. ^ Barclay Tower. SkyscraperPage.com. [2007-11-22]. ^ Paramount Plaza. Emporis.com. [2007-11-19]. ^ Paramount Plaza. SkyscraperPage.com. [2007-11-22]. ^ Seaport Residences: Downtown's Glassy 'Lighthouse' Reaches Top Floor. CityRealty.com. [2018-08-21]. ^ One Seaport Nears Topping Out in The Financial District. New York YIMBY. [2018-06-25]. ^ One Seaport Making Headway, Gets First Glass, Financial District. New York YIMBY. [2018-06-25]. ^ Trump Tower. Emporis.com. [2007-11-19]. ^ Trump Tower. SkyscraperPage.com. [2007-11-22]. ^ Viñoly-Designed 277 Fifth Avenue Officially Tops Out At 55 Floors and 663 Feet in NoMad. New York YIMBY. 2018-03-09 [2018-08-13] （美国英语）. ^ Bank of New York Building. Emporis.com. [2007-11-19]. ^ Bank of New York Building. SkyscraperPage.com. [2007-11-22]. ^ 599 Lexington Avenue. Emporis.com. [2007-11-19]. ^ 599 Lexington Avenue. SkyscraperPage.com. [2007-11-22]. ^ Silver Towers 1. Emporis.com. [2012-07-21]. ^ Silver Towers I. SkyscraperPage.com. [2012-07-21]. ^ Silver Towers 2. Emporis.com. [2012-07-21]. ^ 712 5th Avenue. Emporis.com. [2007-11-19]. ^ 712 Fifth Avenue. SkyscraperPage.com. [2007-11-22]. ^ Chanin Building. Emporis.com. [2007-11-19]. ^ Chanin Building. SkyscraperPage.com. [2007-11-22]. ^ 245 Park Avenue. Emporis.com. [2007-11-19]. ^ 245 Park Avenue. SkyscraperPage.com. [2007-11-22]. ^ Sony Tower. Emporis.com. [2007-11-19]. ^ Sony Plaza. SkyscraperPage.com. [2007-11-22]. ^ Tower 28 In Long Island City About To Top Out As NYC’s Tallest Residential Outside Manhattan. NY YIMBY.com. [2016-05-07]. ^ Queens’s Second Tallest Residential Building Tops Out in Long Island City. Curbed NY.com. [2016-05-05]. ^ Two World Financial Center. Emporis.com. [2007-11-19]. ^ Two World Financial Center. SkyscraperPage.com. [2007-11-22]. ^ One New York Plaza. Emporis.com. [2007-11-19]. ^ One New York Plaza. SkyscraperPage.com. [2007-11-22]. ^ 570 Lexington Avenue. Emporis.com. [2007-11-19]. ^ 570 Lexington Avenue. SkyscraperPage.com. [2007-11-22]. （原始内容存档于2007-11-24）. ^ 1 MiMA Tower. The Skyscraper Center. CTBUH. [2013-03-08]. ^ 345 Park Avenue. Emporis.com. [2007-11-19]. ^ 345 Park Avenue. SkyscraperPage.com. [2007-11-22]. （原始内容存档于2007-11-24）. ^ 400 5th Avenue. Emporis.com. [2010-10-13]. ^ 400 5th Avenue. SkyscraperPage. [2010-10-13]. （原始内容存档于2010-02-02）. ^ W. R. Grace Building. Emporis.com. [2007-11-19]. ^ W. R. Grace Building. SkyscraperPage.com. [2007-11-22]. （原始内容存档于2007-11-24）. ^ Home Insurance Plaza. Emporis.com. [2007-11-19]. ^ Home Insurance Plaza. SkyscraperPage.com. [2007-11-22]. （原始内容存档于2007-11-24）. ^ 1095 Avenue Of The Americas. Emporis.com. [2007-11-19]. ^ Verizon World Headquarters. SkyscraperPage.com. [2007-11-19]. （原始内容存档于2007-11-24）. ^ W New York Downtown Hotel and Residences. SkyscraperPage.com. [2010-12-29]. （原始内容存档于2011-10-18）. ^ 101 Park Avenue. Emporis.com. [2007-11-19]. ^ 101 Park Avenue. SkyscraperPage.com. [2007-11-22]. （原始内容存档于2007-11-24）. ^ One Dag Hammarskjold Plaza. Emporis.com. [2007-11-19]. ^ One Dag Hammarskjold Plaza. SkyscraperPage.com. [2007-11-22]. （原始内容存档于2007-11-24）. ^ Central Park Place. Emporis.com. [2007-11-19]. ^ Central Park Place. SkyscraperPage.com. [2007-11-22]. （原始内容存档于2007-11-24）. ^ 888 7th Avenue. Emporis.com. [2007-11-19]. ^ 888 Seventh Avenue. SkyscraperPage.com. [2007-11-22]. （原始内容存档于2007-11-24）. ^ The Waldorf=Astoria. SkyscraperPage.com. [2007-11-22]. （原始内容存档于2007-11-24）. ^ Burlington House. Emporis.com. [2007-11-19]. ^ Burlington House. SkyscraperPage.com. [2007-11-22]. （原始内容存档于2007-11-24）. ^ Trump Palace Condominiums. Emporis.com. [2007-11-19]. ^ Trump Palace Condominiums. SkyscraperPage.com. [2007-11-22]. （原始内容存档于2007-11-24）. ^ Olympic Tower. Emporis.com. [2007-11-19]. ^ Olympic Tower. SkyscraperPage.com. [2007-11-22]. （原始内容存档于2007-11-24）. ^ Mercantile Building. Emporis.com. [2007-11-19]. ^ Mercantile Building. SkyscraperPage.com. [2007-11-22]. （原始内容存档于2007-11-24）. ^ 425 5th Avenue. Emporis.com. [2007-11-19]. ^ 425 Fifth Avenue. SkyscraperPage.com. [2007-11-22]. （原始内容存档于2007-11-24）. ^ One Madison Park. Emporis.com. [2012-07-21]. ^ One Madison Park. SkyscraperPage.com. [2012-07-21]. （原始内容存档于2012-10-08）. ^ 919 Third Avenue. Emporis.com. [2007-11-19]. ^ 919 Third Avenue. SkyscraperPage.com. [2007-11-22]. （原始内容存档于2007-11-24）. ^ New York Life Building. Emporis.com. [2007-11-19]. ^ New York Life Building. SkyscraperPage.com. [2007-11-22]. （原始内容存档于2007-11-24）. ^ 750 7th Avenue. Emporis.com. [2007-11-19]. ^ 750 Seventh Avenue. SkyscraperPage.com. [2007-11-22]. （原始内容存档于2007-11-24）. ^ The Epic. Emporis.com. [2007-11-19]. ^ The Epic. SkyscraperPage.com. [2007-11-22]. （原始内容存档于2007-11-24）. ^ Eventi. SkyscraperPage.com. [2010-12-29]. （原始内容存档于2010-02-02）. ^ Tower 49. Emporis.com. [2007-11-19]. ^ Tower 49. SkyscraperPage.com. [2007-11-22]. （原始内容存档于2007-11-24）. ^ Extell’s Church-Encroaching 10th Avenue Tower Tops Out, New Interior Renderings Revealed. 6sqft.com. ^ 52-Story, 600-Unit Residential Tower At 551 10th Avenue Gets Glassy, Midtown West. NYYIMBY.com. ^ Emporis. The Hub. Emporis.com. [2015-07-11]. ^ Council on Tall Buildings and Urban Habitat. The Hub. The Skyscraper Center. Council on Tall Buildings and Urban Habitat. [2015-07-11]. ^ Credit Lyonnais Building. Emporis.com. [2007-11-19]. ^ Credit Lyonnais Building. SkyscraperPage.com. [2007-11-22]. （原始内容存档于2007-11-24）. ^ Baccarat Hotel & Residences. en.phorio.com. [2013-11-03]. ^ 250 West 55th Street. SkyscraperPage.com. [2012-09-29]. （原始内容存档于2012-11-01）. ^ The Orion. Emporis.com. [2007-11-19]. ^ The Orion. SkyscraperPage.com. [2007-11-22]. （原始内容存档于2007-11-24）. ^ 590 Madison Avenue. Emporis.com. [2007-11-19]. ^ IBM Building. SkyscraperPage.com. [2007-11-22]. （原始内容存档于2007-11-24）. ^ Times Square Plaza. SkyscraperPage.com. [2012-09-29]. （原始内容存档于2012-10-14）. ^ 11 Times Square. Emporis.com. [2011-05-24]. ^ Marsh & McLennan Headquarters. Emporis.com. [2007-11-19]. ^ 271.0 271.1 271.2 One World Trade Center. SkyscraperPage.com. [2013-05-12]. （原始内容存档于2013-06-05）. ^ Empire State building. Empire State Building Company. [2010-08-04]. （原始内容存档于2005-08-10）. ^ Empire State Building. Encyclopædia Britannica. [2010-08-04]. ^ Harlem River Park Tower I. Emporis.com. [2012-07-21]. ^ Harlem River Park Tower II. Emporis.com. [2012-07-21]. ^ Neighborhoods of Staten Island, New York City. Emporis.com. [2009-09-24]. （原始内容存档于2011-06-04）. ^ Here’s how NYC’s skyline is going to change. New York Post. 2016-01-10. （原始内容存档于April 2, 2016）. ^ name="New York YIMBY"> Nordstrom Tower to Become World’s Tallest Residential Building at 1,775 Feet. New York YIMBY. [2014-07-09]. ^ name="New York YIMBY"> Diagrams Show Nordstrom Tower 217 West 57th Street Will Stand 1,795 Feet Tall, Becoming New York City’s Tallest Building. New York YIMBY. [2015-05-12]. ^ Tall And Slender: The World's Skinniest Skyscraper. ^ Cuozzo, Steve. Construction on One Vanderbilt under way after lawsuit yanked. New York Post. 2016-08-11 [2016-09-23]. （原始内容存档于2016-09-24）. ^ World Trade Center design flaw could cost millions. The Wall Street Journal. Associated Press. 2012-01-31 [2013-03-13]. ^ Warekar, Tanay. Financial District's planned supertall at 45 Broad Street is ready to rise. Vox Media. [2017-04-26]. （原始内容存档于2017-04-26）. ^ Warekar, Tanay. 45 Broad Will Manifest As a Hulking, Gold-Framed Supertall. CurbedNY. Vox Media. [2017-04-26]. （原始内容存档于2017-04-27）. ^ 340 Flatbush Ave Ext. Revealed, Brooklyn’s First Supertall Skyscraper. [2015-11-12]. ^ Clarke, Katherine.JDS, Chetrit land $135M loan for Brooklyn’s tallest tower 互联网档案馆的存檔，存档日期2017-03-31.. The Real Deal. February 24, 2017. Retrieved March 21, 2017. ^ Huen, Eustacia. Inside the $250 Million Apartment at 220 Central Park South, Manhattan's Most Expensive Listing. Forbes (lifestyle). Jun 15, 2016 [2017-09-03]. ^ One Manhattan West. Skyscraper Center. CTBUH. [2017-02-19]. （原始内容存档于2017-02-20）. ^ Foundation Work Begins at 225 West 57th Street and 220 Central Park South. New York YIMBY. [2014-07-19]. ^ 15 Hudson Yards. Skyscraper Page. [2014-07-07]. （原始内容存档于2014-07-01）. ^ Excavation Making Headway for Lightstone’s 130 William Street, Financial District. [2017-08-16]. ^ New looks at the Upper West Side's incoming 668-foot skyscraper. ^ 42-12 28th Street. SkyscraperPage.com. [2014-06-18]. （原始内容存档于2014-07-14）. ^ Jeremiah Budin. Tallest Residential Tower in Queens and BK Will Look Like This - Rendering Reveal - Curbed NY. Ny.curbed.com. 2014-04-07 [2014-08-24]. ^ 1,436-Foot Supertall May Rise at 80 South Street in the Financial District. 6sqft. 2016-03-18. ^ Real Estate heavyweights mull turning Fifth Ave. tower into mall. [2015-09-10]. ^ Reid Wilson on August. YIMBY Today: 15 Penn Plaza Resurrected, Bricking Up Box Street, More. [2014-09-12]. ^ Alberts, Hana R. Another Glassy Condo Tower for Central Park South, Revealed!. Vox Media (Curbed). 2015-05-27 [2015-05-27]. ^ Fedak, Nikolai. Revealed: 520 West 41st Street. New York YIMBY. 2014-07-01 [2014-08-24]. ^ 520 West 41 Street. SkyscraperPage.com. [2014-07-03]. （原始内容存档于2014-07-01）. ^ Rosenberg, Zoe. Behold The Spiral, Bjarke Ingels's Terraced Addition to Hudson Yards. Curbed. 2016-02-08 [2016-02-08]. ^ Weiss, Lois. Vanderbilt corridor set for massive new tower. New York Post. 2015-03-04. ^ Two Manhattan West. Skyscraper Page. [2012-07-22]. （原始内容存档于2012-07-21）. ^ 79-Story Tower Planned at 23-15 44th Drive in Long Island City. YIMBY. [2016-02-08]. ^ Rosenberg, Zoe. Massive Downtown Brooklyn project will include 900 apartments, schools, cultural space. Curbed. 2017-04-03 [2017-04-10]. （原始内容存档于2017-04-05）. ^ Permits Filed: 520 Fifth Avenue to Stand 920 Feet Tall. [2014-12-19]. ^ Luxury Mega-Tower For Sutton Place. [2015-04-08]. ^ Rosenberg, Zoe. JDS Unveils Plans For a Gigantic 77-Story Lower East Side Tower. Curbed. 2016-04-27 [2016-04-29]. ^ This 64-Story Tower May Replace Nomad's Bancroft Building. [2015-09-19]. ^ 800-Foot Tower Planned for 75 Nassau Street. [2014-12-07]. ^ Appelbaum, Alec. Kohn Responds to WTC5 Criticisms. Architectural Record. The McGraw-Hill Companies, Inc. 2007-07-30 [2008-06-16]. ^ 130 Liberty Street. SkyscraperPage.com. [2012-07-22]. （原始内容存档于2012-07-21）. ^ Revealed: 126 Madison Avenue, aka 15 East 30th Street, 730-Foot Condomium Tower. [2015-05-28]. ^ Fedak, Nikolai. Revealed: 470 Eleventh Avenue. New York YIMBY. 2014-05-05 [2014-08-24]. ^ Permits Filed: 281 Fifth Avenue. [2015-05-12]. ^ A New York Skinny Skyscraper Will Have Built-In Parks. [2015-09-28]. ^ 425 Park. 425parkave.com. [2014-08-24]. ^ Jessica Dailey. New Renders Reveal More of Foster's 425 Park Avenue - Development Update-O-Rama - Curbed NY. Ny.curbed.com. 2014-07-09 [2014-08-24]. ^ Fedak, Nikolai. Permits Filed: 242 West 53rd Street. New York YIMBY. 2014-06-10 [2014-08-24]. ^ Luxe Condos at 'Ground Zero Mosque' Site Aim High on Pricing. [2015-09-28]. ^ Condos, Floating Gardens Alternate in Wild Midtown Tower. [2015-04-25]. ^ Plans Revealed For 600-Foot Downtown Brooklyn Office Tower. [2015-11-12]. ^ 337.0 337.1 One World Trade Center. SkyscraperPage.com. [2007-11-19]. （原始内容存档于2007-10-30）. ^ Two World Trade Center. Emporis.com. [2007-11-19]. ^ Two World Trade Center. SkyscraperPage.com. [2014-05-07]. ^ Singer Building. CTBUH. [2012-07-22]. （原始内容存档于2013-07-30）. ^ Singer Building. SkyscraperPage.com. [2012-07-22]. （原始内容存档于2012-10-12）. ^ 7 World Trade Center. Emporis.com. [2007-11-19]. ^ 7 World Trade Center. SkyscraperPage.com. [2007-11-19]. （原始内容存档于2007-11-24）. ^ 130 Liberty Street. Emporis.com. [2007-11-22]. ^ Deutsche Bank Building. SkyscraperPage.com. [2007-11-22]. （原始内容存档于2007-11-24）. ^ Congregation History. The (Collegiate) Reformed Protestant Dutch Church Of the City of New York. [2012-07-22]. ^ 347.0 347.1 Trinity Church. SkyscraperPage.com. [2007-11-30]. （原始内容存档于2008-05-29）. ^ Pollak, Michael. F.Y.I. : Over the Bounding Pond. New York Times. 2005-08-28 [2010-11-29]. ^ Manhattan Life Insurance Building. Emporis.com. [2007-11-30]. ^ Park Row Building. SkyscraperPage.com. [2007-11-22]. （原始内容存档于2007-11-24）. ^ Singer Building. SkyscraperPage.com. [2007-11-19]. （原始内容存档于2012-10-12）.